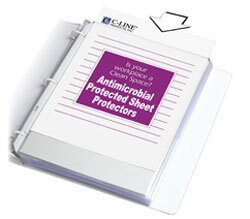 Do-it-yourself laminating film with built-in antimicrobial protection preserves documents. Antimicrobial protection helps prevent the growth of stain causing bacteria, yeasts, molds, and fungi. Cleer Adheer® adds waterproof, tear-resistant permanent protection without heat or special equipment. 9 x 12; can be cut to any size; grid pattern on split-back liner makes trimming easy. Great for news clippings, pictures, photos, etc. Triclosan-free. Clear. 50/BX.